Collaborative university efforts are driving ground-floor biotech discoveries. Nick Boulis has the audacity to believe, out loud, that discoveries and therapies designed to improve the human condition – world-changing breakthroughs that have been happening and are happening right now in Georgia – are just as important as fighter planes or even football. 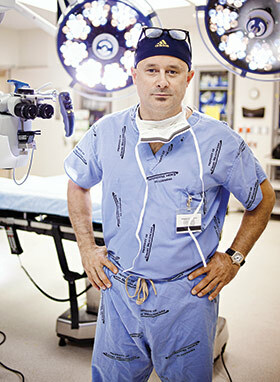 Sure, he might be bordering on sacrilege, but Boulis is a groundbreaking Emory neurosurgeon working on cutting-edge therapies to treat some of mankind’s most devastating, incurable (so far) maladies. So he comes to his blasphemy from an honest place. “There are those who actually think it might be almost as important as throwing a football,” Boulis says in almost hushed tones. The kind of badass work Boulis is talking about encompasses the relatively new field of regenerative medicine – the process of repairing, replacing or regenerating damaged human cells, tissues, bones or organs, sometimes through stimulating the body’s innate repair mechanisms, sometimes with the help of stem cells and the creation of tissues, organs and whatnot in the lab. It’s a growing effort under the biotech umbrella, and its bringing together scientists from some of Georgia’s leading research universities in a widespread collaborative endeavor. While Georgia leaders still warm themselves in the afterglow of last year’s announcement that Baxter International is going to build a $1-billion plasma processing plant about 40 miles east of Atlanta, the really interesting stuff is happening in university labs and in clinical trials, where the long-promised potential of stem cell research grows ever closer to becoming a bedside reality. “The field is moving fast, and this is a really good sign for all of us in the future,” says Steve Stice, professor and director of the Regenerative Bioscience Center at the University of Georgia. The challenge, of course, is money, or the lack of it. Federal funding for the National Institutes of Health (NIH, the largest source of support for medical research, comprises less than one percent of the total U.S. budget) has been declining steadily since 2003. And most recently, federally im-posed sequestration is forcing the NIH to cut about $1.55 billion from its FY 2013 budget, which means about 700 fewer grants this year. House Republicans have already suggested further cuts to NIH next year. Bob Guldberg, executive director of Georgia Tech’s Parker H. Petit (it’s pronounced “petite”) In-stitute for Bioengineering & Bioscience, goes to Washington, D.C., three times a year to review applications for the NIH group he leads. “And it’s really depressing to read about this great science and that great research that is unfortunately not going to be funded because the funding rates have fallen so low,” says Guldberg, who chairs the Musculoskeletal Tissue Engineering Study Section in the Center for Scientific Review (part of NIH). For people in the business of healing, like Dr. Boulis, the slowing trickle of public money reflects more than a troubled economy: There are some misplaced priorities at work. Boulis and his team at Emory won FDA approval to start clinical trials to inject neural stem cells into patients with spinal cord injuries, a planned venture that would happen at Emory and Shepherd Center in Atlanta. Even so, Boulis is conducting other revolutionary clinical trials and scientists are making discoveries that may lead to treatments for catastrophic neurological disorders, while Children’s Healthcare of Atlanta (CHOA) and Georgia Tech have just embarked on a $20-million partnership (they anted up $10 million each), bringing Tech’s engineers together with Emory physicians at CHOA in a quest to develop medical technologies for pediatric care, with an emphasis on medical devices, nanomedicine and regenerative medicine. In January (as it does every year), Georgia Bio announced its Deals of the Year in life sciences, recognizing significant transactions by pharmaceutical, biopharmaceutical and medical device companies. Baxter was the easy winner in the Economic Development category for 2012. The top deal in the Public/Private Collaboration category was the CHOA-Georgia Tech joint investment, which is basically a sharp ramping up of a partnership that has existed for years. Essentially, the goals are to improve the tools for treating childhood health issues, to scale machines, equipment and therapies designed for adults to fit children. “Our healthcare system is built around treating end-stage disease,” says Guldberg, who also is co-director of the Center for Pediatric Innovation at CHOA. “If we want to make our healthcare investment pay off, why not treat people before they get sick? Why not invest more in pediatric healthcare? That’s a no brainer, especially when we’re talking about potential regenerative medicine solutions. Regenerative therapies, especially those based on stem cell research, is still an emerging industry, and one with large dollar potential, says Guldberg, who wears many hats, including chair of the Americas chapter of TERMIS – Tissue Engineering and Regenerative Medicine International Society, which is holding its international conference in Atlanta this November. “This is becoming a very real industry that people are going to make money in and develop products. There is something on the order of 300 clinical trials out there now testing regenerative products,” Guldberg says. Georgia Tech has become an international ground floor hub with creation of its Stem Cell Engineering Center, which is helping to prepare a new generation of experts in the mass production and commercialization of stem cell technologies that will become tomorrow’s medicine. “There is going to be a need in the coming years for a workforce of people with training and background in manufacturing and bioprocessing,” says Todd McDevitt, director of the Stem Cell Engineering Center. Three years ago, with funding from the National Science Foundation, McDevitt led development of the Integrative Graduate Education and Research Traineeship (IGERT), which is designed to educate and train Ph.D. students in the translation and commercialization of stem cell technologies. So McDevitt’s team is preparing the engineers who will be leaders in stem cell biomanufacturing. “Biomanufacturing is important to the future of our country and also the future of mankind,” says Ben Wang, executive director of the Georgia Tech Manufacturing Institute, which he describes as, “a community of university faculty, staff and students who are really passionate about driving manufacturing innovation. Wang says the idea is to achieve some form of scalable, mass production, but nothing like making cars or iPhones, where you’re making millions of the same exact product. “We’re talking about ‘mass customization.’ Biomedical products will have to be highly customized, but efficient, affordable,” he says. “So the question is, how do we turn scientific discovery into mass produced, customized products. In other words, they are basically inventing a new industry at the cellular level. Commercially developed stem cell products are projected to be a $10-billion industry within a decade. Steve Stice wants to be perfectly clear about this, just in case there’s any lingering confusion: They’re not building a race of pigmen in his lab at the University of Georgia. But they are doing stuff in real life that used to belong to science fiction and superhero stories. Stice’s lab (along with UGA’s Col-lege of Veterinary Medicine professor John Peroni and scientists from Baylor College, Rice University and the University of Texas) is developing something he calls “fracture putty,” a stem cell derived gel designed to dramatically accelerate the repair of broken bones (funded by the Department of Defense, DOD). Ten years ago, Stice started ArunA Biomedical, which is still discovering, manufacturing and commercializing human stem cell technology. (They were the first company to commercialize products derived from human embryonic stem cells.) Business is good. Some of it is hopeful – a group from Pfizer using ArunA cells to test new compounds for Alzheimer’s disease; some, downright frightening – the DOD using ArunA cells to test for potential weapons of mass destruction. The bone regeneration product line is growing (a concept that, when you read it aloud, sounds like it was lifted from a Michael Crichton novel), and the company continues to make an impact in the development of neural stem cells. Stice says they’re now developing astrocytes, which are the most abundant cells of the human brain. One of ArunA’s happy astrocyte customers is Dr. Boulis, who is using some of the products developed in Stice’s lab in his own work. For years Boulis has been trying to come up with ways to protect the nervous system or repair it. Much of his work has been focused on ALS (Lou Gehrig’s Disease). In 2010, he made history with the launch of the first human clinical trials testing stem cells in patients with ALS. Neuralstem, a Maryland-based company, funded the trial at Emory. Boulis focused on very small doses with an emphasis on testing the safety of the procedure, which involved injections directly to first the lumbar spine (lower), then the cervical spine (upper). Boulis was to begin a Phase II trial this fall, in which the injected dosage will be scaled up, so instead of testing only for safety, he hopes to gather some reliable evidence on the therapeutic benefits. The new trial will also include the Uni-versity of Michigan and Massachusetts General Hospital. Plus, Boulis is helping with clinical trials in Italy and assisting the California Institute for Regenerative Medicine (CIRM) in upcoming trials, using different stem cell types. “They don’t have a lot of extra money lying around in California, but they’re making strategic investments in biotechnology,” says Boulis, who wants the people of Geor-gia to recognize what the check signers in California already recognize. “They’ve inviting us to one of the three sites in their upcoming clinical trials, because they recognize that we are pioneers in this field. California has put billions of dollars into this, and it’s brought a lot of world-class scientists to California.